It appears joy news sold its integrity, common sense and reputation in the above news item. It is apparent that the reporter of the above news item, acted on the orders of some known crooks, who paid him with looted State funds to come up with that disgraceful publication. 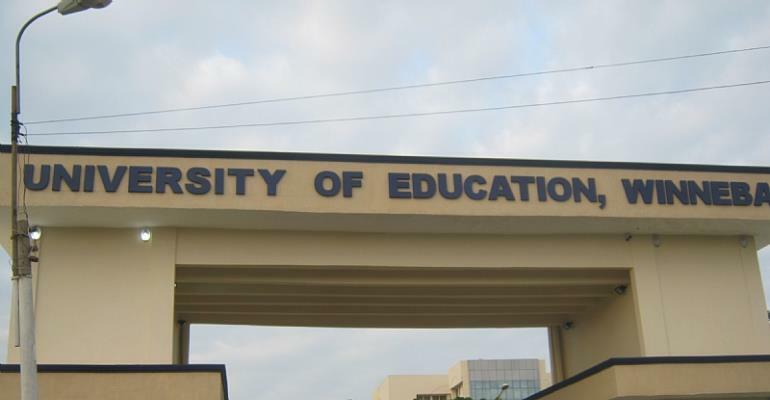 The Governing Council of the University of Education, Winneba (UEW), dismissed Prof. Mawutor Avoke and the five other officials for blatant procurement violations, based on the findings of a Fact Finding Committee (FFC), and NOT any shambolic and corruption-tainted Economic and Organized Crime Office (EOCO) Report. To educate this reporter and other like-minded individuals, in most cases of causing financial loss to the State, several charges are usually preferred against the defendant (s) by the prosecution, and most often at the end of the trial, one or two of the charges, would stick. Therefore, Prof. Avoke and the other dismissed officials being shamefully exonerated by a bogus EOCO Report, is in NO way conveying a not guilty message in respect of Prof. Avoke and his fellow partners in procurement breaches. Procurement & Project Management Consultancy (PPMC), was the Consultancy firm engaged by UEW to evaluate all the contentious contracts, whose report, NOT MY REPORT, concluded that Proteus Ltd, and all the other contractors the dismissed Vice-Chancellor (VC) awarded almost all the said contracts to, were not qualified. For example, in a Tender Evaluation undertaken by PPMC, regarding the Construction of the Lectures' Office Complex at the north campus of UEW, the Consultants recommended re- tender of the said contract, since in the Consultants' view, "none of the bidders has been determined as qualified and capable of performing the contract". This is plain English, and therefore, need no further clarification. Why this contract was NEVER re-tendered, but awarded to Sparkx Gh Ltd, by Prof. Avoke and the other dismissed officials, bothers on criminal wrongdoing, as specified under section 92 (2) (b) and (c) of the Public Procurement Act 2003, Act 663, as amended. The penalty for this, is a fine not exceeding a prescribed amount, or to a term of imprisonment not exceeding 5 years, or to both. Section 22 (2) of Act 663 as amended, provides that: "The procurement entity may require tenderers to provide appropriate documentary evidence or other information that it considers useful to satisfy itself that the tenderers are qualified in accordance with the criteria referred to in subsection (1)". The criteria in subsection (1) include: Professional and technical qualifications and competence; financial resources; equipment and other physical facilities; managerial capability, reliability, experience in the procurement object and reputation; and the personnel to perform the procurement contract. The Consultants, PPMC, of P. O. Box AF 1701, Adenta, Accra, after examining the bids of all the tenderers for the construction of the Lecturers' Office Complex at the north campus, disqualified all the six (6) tenderers. All the tenderers failed to meet the set criteria in subsection (1) of Act 663 as amended, as captured in the Tender Documents. The tenderers are: Sparkx (SM) Ghana Ltd, Ghc 13,276,721.52; Donajos Co. Ltd, Ghc 16,974,650.50; Wilkado Construction Co. Ltd, Ghc 19,807,292.95; Paabadu Construction Ltd, 20,989,507.62; Western Logistics, Construction & Supplies Ltd, Ghc 18,685,019.64; and Antarctic Contract Works Ltd, Ghc 19,315,468.16. All disqualified!! The Consultants, PPMC, per the provisions of Act 663, therefore duly recommended that the said contract, be re-advertised. However, this was fragrantly ignored by the dismissed VC. He went ahead in clear breach of Act 663 to award that particular contract to Sparkx (SM) Ghana Ltd. The law that the dismissed VC derived authority from to override Act 663 in the award of all the contracts in question, is what Prof. Avoke and his partners in crime, should be quoting to prove their innocence, and NOT a cooked EOCO Report. A million botched EOCO Reports, published by compromised journalists, is more worthless than a used toilet paper. The Special Prosecutor is empowered under the Special Prosecutor Act 2018 (Act 959), to investigate alleged corruption and corruption related offences under the Public Procurement Act 2003 (Act 663) as amended. A clear and unambiguous message to whoever has circumvented Act 663 to award contracts to friends and cronies. No wonder the President of the Republic, His Excellency Nana Akufo-Addo, saw the shortcomings of EOCO with regards violations of Act 663, even in opposition, and subsequently promised setting up the Special Prosecutor’s Office, to specifically handle investigations into breaches of Act 663, which he has fulfilled. If someone faintly believe that it is a declaration of media war that would exonerate Prof. Avoke from the above stated procurement breaches, then so be it. Following the advert for the Construction of the GUSSS Hostel Block - Kumasi Site, 5 bids were received from Santa Baron Ventures Ltd, Ghc 49,809,595.07; Berock Ventures Ltd, Ghc 55,523,963.85; Nickseth Construction Co. Ltd, Ghc 51,959,139.31; Antarctic Contract Works Ltd, Ghc 44,928,829.33; and Proteus Ltd, Ghc 84,887,278.38. This is where it gets interesting. All five (5) tenderers, were disqualified for failing to meet some or all of the requirements as stipulated in the tender documents. See attached document. It is provided under section 22 (3), of the Public Procurement Act 2003 (Act 663) as amended that: “Any requirement established pursuant to this section stated in the tender documents or other documents for invitation of proposals shall apply equally to the tenderers". It was a requirement of the tender documents that all tenderers (equal application of the law) should submit financial statements for the past three (3) years and proof of line of credit among several other requirements. Proteus Ltd failed to submit financial statements for the last three (3) years, and also failed to submit proof of line of credit, and yet was awarded the contract for the Construction of the GUSSS Hostel Block - Kumasi Site. Antarctic Contract Works Ltd and Proteus Ltd did not even make it to the Evaluation stage, and yet the eventual 'winner' of this contract, was Proteus Ltd, with the highest read-out tender price of Ghc 84,887,278.38. Magically, this over Ghc 84m read-out tender price of Proteus Ltd, which was not considered for Evaluation, was awarded the contract in question, based solely on the conjured 'Prof. Avoke'/Ackorlie read-out tender price of Ghc 45,719,523.56. The answers required from the dismissed VC and Ackorlie are: Based on what relevant laws of this country, was the read-out Tender Price of Proteus Ltd, got drastically reduced from over Ghc 84m, to just over Ghc 45m? Secondly, even though awarding the said contract to Antarctic Contract Works Ltd, would have been illegal because it was also not evaluated, and subsequently disqualified, Antarctic Ltd, had the lowest read-out Tender Price of Ghc 44,928,829.33. Why was this contract not awarded to Antarctic Contract Works Ltd? Over to you, joy news and your paymasters! Joy news has really fucked up ‘big time’ on this one! Was it the Council Chairman (Prof. Abakah) or the current VC of UEW (Rev. Fr. Prof. Afful-Broni), who directed Prof. Avoke and his hired 'assassins' to illegally award this contract to Proteus Ltd? Section 22 (4) of Act 663 as amended, goes further to provide that: "The procurement entity shall evaluate the qualifications of candidates in accordance with the criteria and procedures stated in the documents referred to in subsection (3)". The documents here refer to the tender documents, and the procedure refers to doing due diligence on receipt of tenders, by scrutinising the documents submitted by the tenderers, to ensure compliance with advertised requirements and going further to consider the price quotations to ensure value for money. Section 22 (3) and (4) of Act 663 as amended, were clearly breached by the dismissed VC and Ackorlie in the award of the said contract. Probably their decision was based on an unknown Procurement Law in Ghana, therefore, to stop the son of upright peasant farmer from making further noise in this regard, joy news, and all the other accomplices in nation looting, who willfully and fragrantly circumvented Act 663 as amended in the award of multiple contracts, ought to make the said law, public. Joy news will really serve Mother Ghana, much better in this regard. From my little experience with joy news and other ‘hijacked’ media houses in this country, this rejoinder, would not be given equal prominence such as was accorded the original news item. If other people honestly believe that they are putting the right and accurate information out there, why should they be afraid of rebuttals? Why should some people go to the extreme of buying off some tramps in selected media houses not to air my views? Ghanaweb appear to be the most compromised media outlet in this respect, probably followed by the Multi Media Group. Even when I wasted time and resources to travel all the way from Winneba to Accra for a PM Express programme on joy TV, I was given less than 10 minutes cumulatively for the entire programme, while some people who sat in the comfort of their homes and joined the programme via phone, and who appeared to be associated with the ‘hijackers’ of the Ghanaian media, were allocated a greater percentage of the programme time. Only cowards and persons with low intelligence, are afraid of their opponents!! This author has authored 101 publications on Modern Ghana.